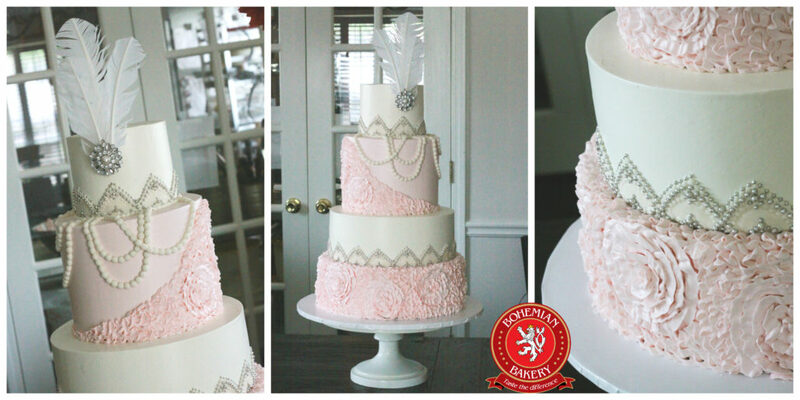 Today’s Bohemian Bakery featured wedding cake is the perfect marriage of trend and elegance. We’re heading back to the first half of the 20th century with this exquisite Art Deco pink and silver wedding cake design with feathers and luxurious pearls. This stunning four tiered vintage wedding cake is made out of Italian butter cream icing. Mostly, you will see these types of designs in fondant, but, per our customer’s request, we were able to make this custom design in butter cream. We are bake-to-order ONLINE bakery. Our wedding cake tastings are in Buford, GA and we have pickup locations in both Buford, GA and Suwanee, GA.